Japan adopted a lot of things from China, such as the language. In the year 400 they started using Chinese characters as their main form of writing. After a while they pronounced the writing in a Korean way. Japanese Drama has to main forms the noh, where they wear light make up and they retell legends and folktales. The Actors wore wooden masks to show emotions such as happiness or anger. It was meant for the upper class people and the common people. Then, there was the Kabuki, where only men can preform. Instead of the noh where they wear light make up, They wear heavy make up. This type of drama was meant of the common people and it was performed by the common people. There was a very popular type of poetry that the Japanese invented, the haiku it was only 17 syllables of 5 on the first line, 7 on the second, and 5 on the third. These poems were mainly about nature. The sun will soon rise"
The Tale of Genji is one of the first novels ever written. 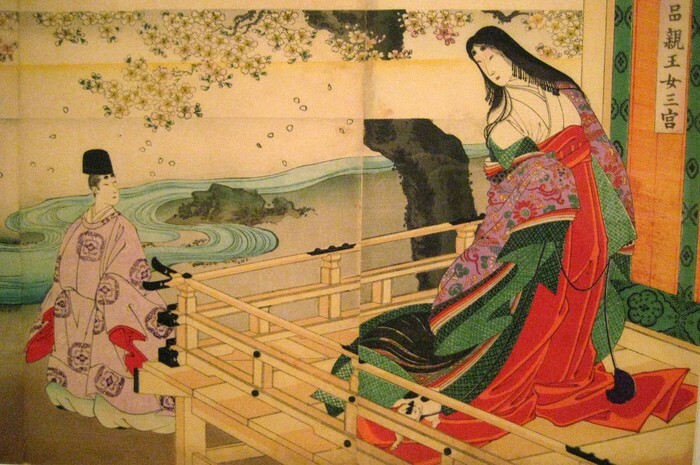 It was written by Lady Murasaki Shikibu. The book was in the first person it was a very long and realistic story, thats why it was so popular in Japan.